Point Pleasant senior Cason Payne (7) follows a block by James Musgrave (13) into the end zone for a touchdown during the third quarter of Saturday’s Class AA opening round playoff game against Mingo Central at OVB Field in Point Pleasant, W.Va.
POINT PLEASANT, W.Va. — Cason Payne ran for 242 yards and six touchdowns as eighth-seeded Point Pleasant claimed a 65-36 victory over ninth-seeded Mingo Central on Saturday in the opening round of the Class AA playoffs at Ohio Valley Bank Track and Field. The Big Blacks (9-1) churned out 647 yards of total offense and held the Miners (8-3) without an offensive touchdown in the second half, allowing Point to turn a 29-all game at halftime into a sizable 29-point triumph. Payne had three rushing touchdowns in each half, and junior Brady Adkins added 151 rushing yards and three scores as the Big Blacks advanced to the second round of the playoffs for a sixth consecutive postseason. Mingo Central, which had 301 yards of total offense in the first half, mustered just 94 yards after the break. Daylin Goad completed 27-of-43 passes for 286 yards, throwing two touchdowns and one interception. Drew Hatfield — who had a 76-yard kickoff return for a score in the third quarter — paced MCHS with a dozen catches for 125 yards. 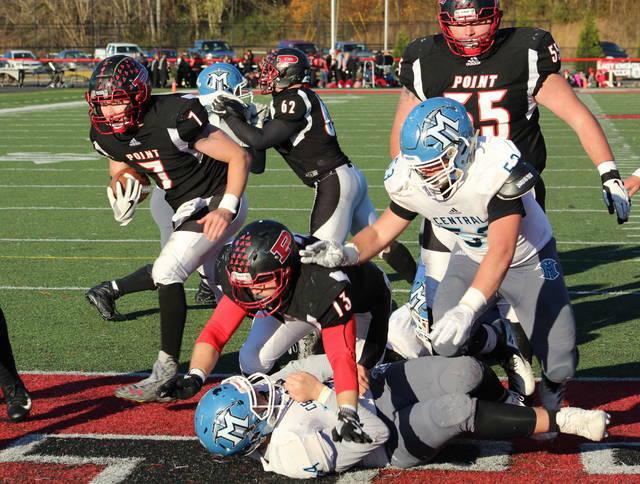 It’s the first time in five postseasons that Mingo Central has not won a playoff game. Point Pleasant, which never trailed in the contest, advances to face top-seeded Fairmont Senior in the Class AA quarterfinals. https://www.mydailysentinel.com/wp-content/uploads/sites/14/2018/11/web1_PP-Payne.jpgPoint Pleasant senior Cason Payne (7) follows a block by James Musgrave (13) into the end zone for a touchdown during the third quarter of Saturday’s Class AA opening round playoff game against Mingo Central at OVB Field in Point Pleasant, W.Va.